Travel through the tourist destinations of India while on your cooking tour, savour curries and chutneys, relish the flavours, and breathe in the aroma of subtle spices, while you observe demonstrations by master chefs of Indian cookery and enjoy the delicious meals prepared for you. This is what our extra special cooking tours in India offer you. 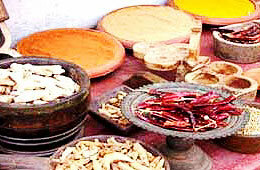 Explore and rediscover the culinary wealth of India on your cooking tour of India. North India is known for its Mughlai cuisine, a creation of the chefs of the Mughal emperors. Known for its rich curries and heady aroma of spices, Mughlai cuisine has in store both vegetarian and non-vegetarian dishes for you. Up towards the North, the Kashmiri cuisine is known for its traditional feast or Waazwan, where many different meat dishes are prepared and served on a white sheet. The Kashmiris are very proud of their culinary skills. Enjoy your Culinary Tour with the Kashmiris in a traditional manner and eat while being seated on the floor. Because of India's long coastline, seafood is quite popular with India's culinary experts. 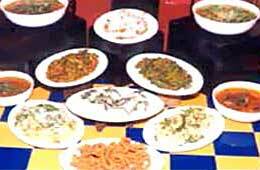 Different states in India have different recipes of preparing and cooking varieties of seafood. Different species of fish, crabs, shrimp, mussels and prawns are fried, baked, picked, salted and preserved to make delicious dishes having a unique taste of their own. The cooking tour of India acquaints you with this surprising yet interesting fact. Staple food items include various kinds of Indian flatbread, naan, chappatis, rotis, puris eaten along with vegetables, meat dishes, chutneys and pickles. In the south and East of the country, rice is the staple dish eaten at most meals along with pulses and yoghurt. South India is known for steamed and fried pancakes called idlis and dosas, made from ground rice flour and pulses. The Macchhi Bhat (Fish Curry and Rice) in West Bengal is stuck with the identification of Bengali community whether Brahmins or Non-Brahmins. Specially the Dal-Bati and Dal-Bafle of Rajasthan; Zarda (sweet rice) and Kabab Tikkas in Muslim cuisine; Dhokla and Khamand (sour snack item) of Gujarati cuisine; Five types of rice made in Tamil Nadu cuisine; Bhel Puri and Poha Maharashtrian cuisine etc. constitute the must eats of Indian cuisine. India is a vegetarian paradise constituting the majority of population with vegetarian eating habits. Indias vegetarian culinary expertise are par excellnce. The variety of fruits and vegetables found here and the numerous methods of cooking them are truly amazing in India. The mouthwatering Bengali sweets made primarily of milk and sugar is a delectable treat. The other popular sweets are the Choorma ke Laddoo of Rajasthan, Puran Poli of Maharashtra, Paysam of Tamil Nadu and Kerala, Srikhand of Madhya Pradesh etc. If food is an adventure, then a cooking or culinary tour of India is an adventure of a lifetime that is not to be missed. Enjoy the diverse tastes of India on an Indian cooking tour.